The two interrelated forms play on the positive and negative; a pivotal and recurring theme in my artwork. The Vertical Disk: The double sided disk references the existing stone surrounds of the reflection pools that step down the valley. 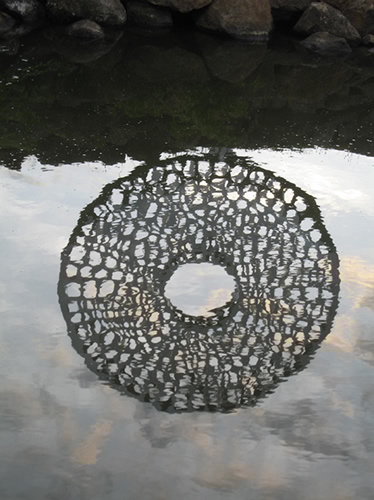 The organic honeycomb form alludes to cellular structures, fungi, estuarine channels and interconnecting streams. The Horizontal Disk: A 'shadow' form was created from the 'drop-outs' of the Vertical disk; a complex assemblage of randomly patterned steel 'stones'. The horizontal form appears to 'float' above the pond surface. From certain vantage points, the work becomes an optical game. The vertical disk is reflected in the same pool as the Horizontal disk - its negative "reflection". Dimensions: Vertical Work; Diameter 3000mm x Depth 450mm tapering to 60mm. Horizontal Work; Diameter 3000mm.